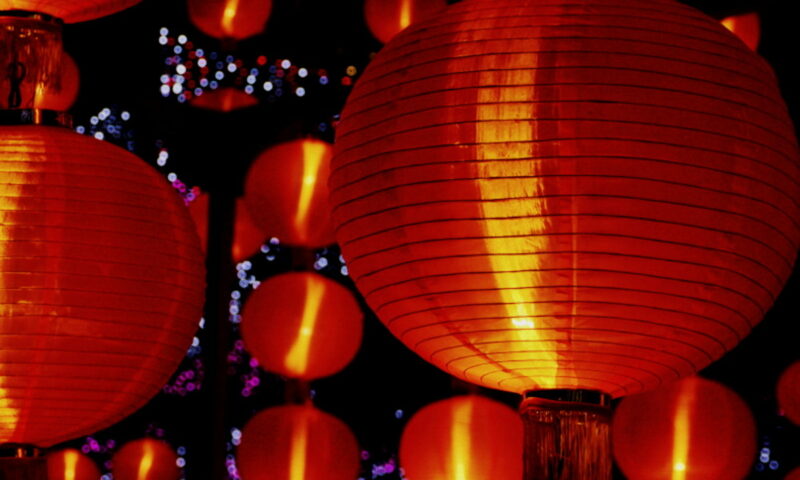 Discovery – every day's a holiday! October 12, 1492. Perhaps no date in Pan-American history is as important or controversial. By October 11, 1492, Columbus’s crew had had enough. The trip was too long. They had spotted weeds and birds—signs of land—for weeks, but not a hint of soil. And at the rate they were going, many were afraid there would hardly be enough headwind to take them back to Spain. Each day, Columbus lied to the men about how far they’d traveled, so as not to worry them more about the distance between themselves and civilization. Also, he noted how when he showed them his sword, they had never seen such a thing. They gripped it by blade and were surprised to find themselves cut. It was a foretelling symbol of the future of the two peoples and their relations. Throughout much of the Americas, Columbus is derided as the bringer of devastation to two continents and the precursor to the genocide of millions of people. “When Columbus sent back hundreds of Taino indians to be sold as slaves, Queen Isabella ordered them free and returned to their land. Eventually, the European colonists and sovereigns became so discontent with Columbus’ mismanagement that he was arrested and shipped back to Spain in chains. He spent the rest of his life trying to regain his governorship over Hispaniola. 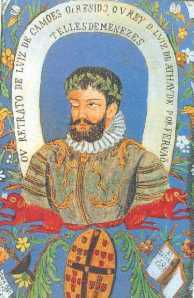 “The government of Columbus was brutal and violated human dignity and the moral senses of his contemporaries. He was the first to establish institutions of slavery and brutal conquest that would lead to the demise of the nations and people who already called the Western Hemisphere their home. Historians have still not settled upon a psychological portrait of the man around whom so much of world history hinges upon. 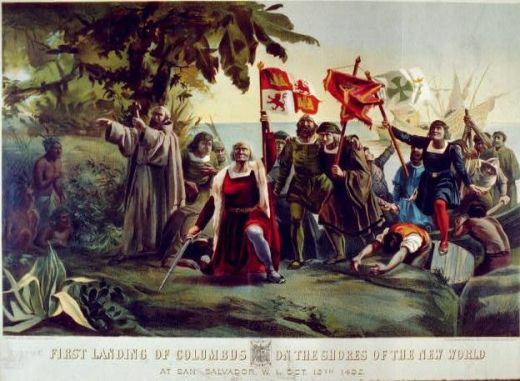 Unlike the kings of the day whom history recorded so fastidiously, Columbus was a relative nobody until 1492. Had Columbus turned back on October 11, the New World would never have been discovered, and the indigenous tribes of the Americas would have lived in peace for hundreds of years. Unlikely. 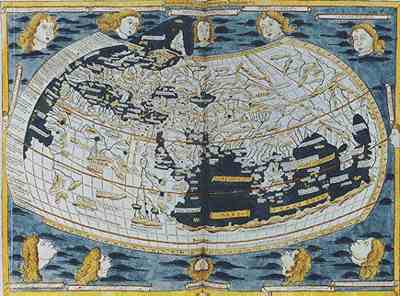 The idea had flourished in Europe that if the world was round a quicker way to the Orient must exist, and had Columbus turned back, it was only a matter of time before others would go the distance. Whether the actions of another discoverer could have stemmed the brutality, slavery and genocide, we will never know. Today in the United States, over 500 years later, Columbus is one of four individuals honored with a federal holiday. The others are Martin Luther King Jr., George Washington, and Jesus Christ. Leif was the son of Norseman Erik the Red. 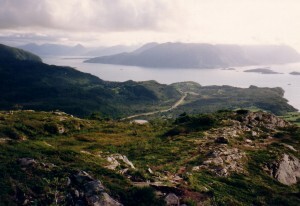 According to the Norse sagas, Erik’s family had been exiled from Norway because of his father’s part in some killings there. Rather than head east, Erik followed the sun, landing in a frozen wasteland he deceptively named “Greenland” to attract settlers. The ploy worked. 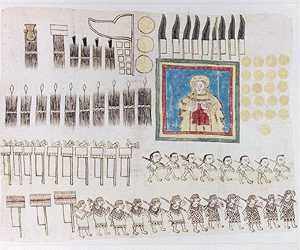 Small Norse settlements on Greenland survived over 400 years, although at no time did the Norse population surpass 5000. 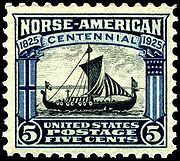 The last written record of the Norse settlement’s existence was from a wedding dated 1408. Leif’s father Erik was a pagan, his mother a Christian. Leif followed his mother’s religion, but carried on the male tradition—not of murder and banishment, but of heading west into the great unknown. 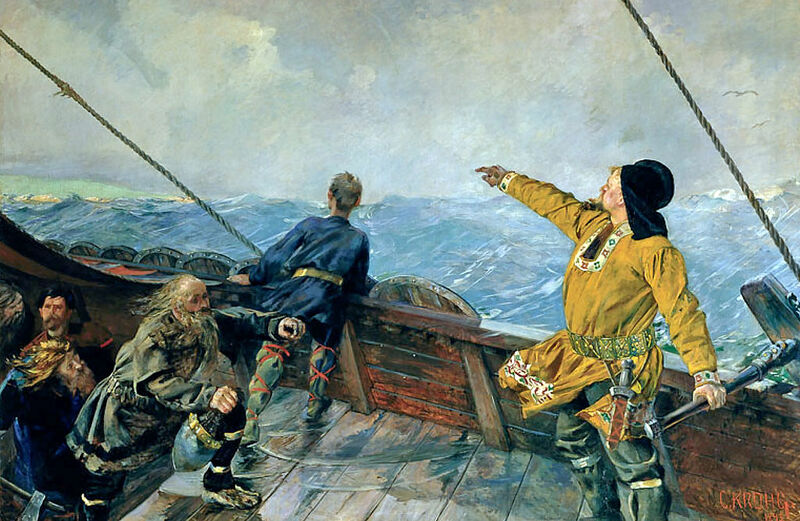 Leif had heard of a land to the west from a trader named Bjarni Herjolfsson, who had been blown off course on his way from Iceland to Greenland. Despite being the first European to site mainland North America, Herjolfsson was too anxious to get to Greenland to even make a pitstop. 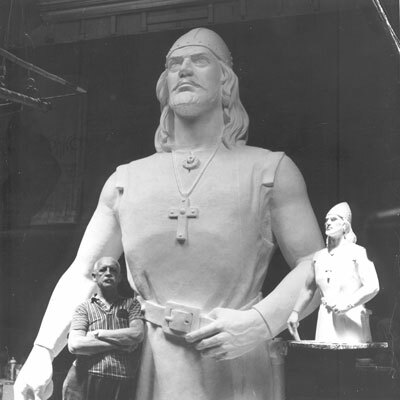 Had he been more patient, we might be celebrating Bjarni Herjolfsson Day today, but as it was, Bjarni passed word onto Leif, who gathered men to explore. According to the sagas, Leif and his followers founded three North American settlements: Helluland (land of flat stones), Markland (forest land) and Vinland (meadow land.) But none of the settlements reached the size or longevity of Greenland, and knowledge of the existence of the land disappeared for centuries. In the 1960s archaeologists excavated the remains of a Norse settlement at L’Anse aux Meadows in Newfoundland, the first conclusive proof of Viking settlement in mainland North America. 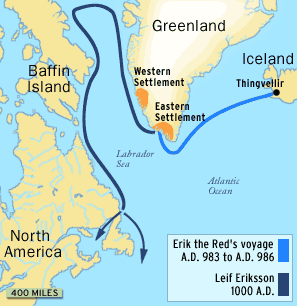 In 1963 Congress declared October 9 “Leif Erikson Day,” following the lead of states like Wisconsin and Minnesota. October 9th isn’t actually Leif’s birthday, or the day he discovered North America. Nope, October 9th marks the anniversary of the arrival of the “Sloopers,”–early Norwegian immigrants to the U.S.–in New York Harbor aboard the ship Restauration, in 1825, following in the ancient wake of their daring westbound ancestor. To all my Norwegian friends, Uff da! This day’s for you. 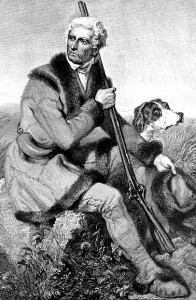 Today the Kentucky Historical Society celebrates the life of Daniel Boone, American pioneer and legendary folk hero. Daniel Boone was born on a mountaintop in Tennessee, greenest state in the land of the—wait no—mixing up my folk heroes here. Boone was born in Eastern Pennsylvania, not Tennessee, but like Davy Crockett he was indeed raised in the woods so he knew every tree. No record of when he killed his first bear, but he was an expert hunter/trapper by age twelve. Boone had two siblings who scandalized the Quaker world by marrying “worldlings”, ie. non-Quakers. This scandal may or may not have contributed to the family’s decision to move further west to the Shenandoah Valley and then to North Carolina in 1751. He married Rebecca Bryan five years later, and fought in the French and Indian War. June 7 was chosen as Boone Day because it marks the supposed anniversary of the pioneer’s entry into Kentucky in 1767. Two years later, Boone’s friend, a trader named John Findley, asked Boone to help him explore the unchartered wilderness, and Boone obliged. 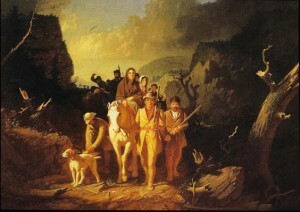 Boone’s most famous trek may have been through 200 miles of Virginian wilderness to the Cumberland Gap, a journey immortalized by Caleb Bingham in his 1851 painting. Thousands of settlers later followed Boone’s path to make their way inland toward the Kentucky River. That Boone Day, however, was celebrated on June 15th. By 1922, the Kentucky Historical Society extended a cordial invitation to readers and friends “to attend Boone Day exercises on June 7”, the traditional anniversary of the day in 1767 that Boone first explored the backwoods of what is now Kentucky.